MEDICAL OPTOMETRIC CARE will give you the absolute best return on investment of any ophthalmic equipment you have in your clinic. 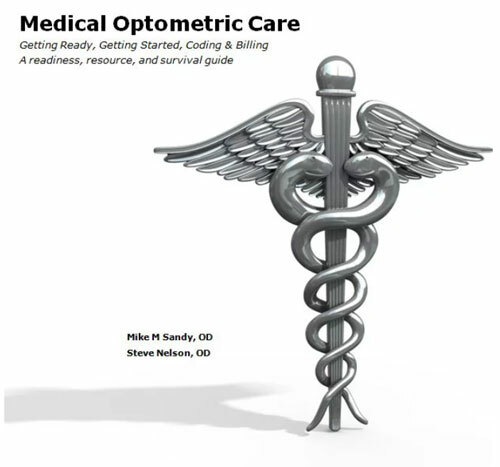 It is a readiness, resource, and survival guide for medical optometry. We show how to get started, how to enroll, getting credentialed, setting your fees, and understanding medical insurance terminology. We discuss if, when, and how to outsource to a billing company. We help you understand appropriate examination documentation, choosing appropriate examination CPT codes, understanding modifiers, and comparing and contrasting all the different exam codes (Ophthalmological, Evaluation & Management, and S-Codes). The guide includes comprehensive service coding for diabetes care, cataract surgery co-management, dry eyes, allergies, Plaquenil use, and glaucoma including templates for patient letters to their primary care physicians you can use and modify. Example claims are shown with appropriate coding and modifiers. The guide outlines full coding and documentation requirements for the special ophthalmic diagnostic services: fundus photography, OCT, anterior seg photography, visual fields, extended ophthalmoscopy, gonio, pachymetry, etc. including sample interpretation and reports. THE GUIDE IS FULLY UPDATED FOR CURRENT ICD-10.